Suit up with this Teenage Mutant Ninja Turtles Shredder 3D Molded Armor Samurai Backpack! 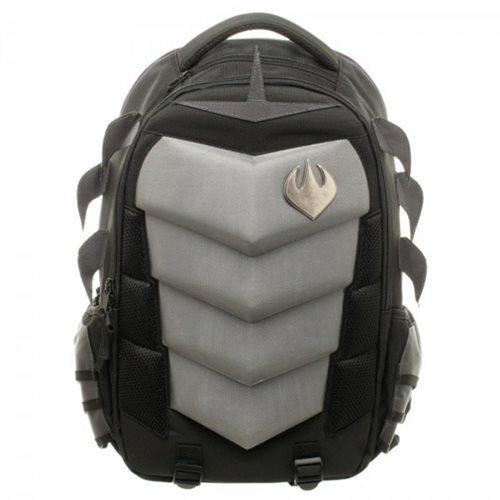 This awesome backpack is inspired by the notorious Shredder and his samurai armor. The exterior features ribbed armor with the Foot Clan logo and on the sides of the backpack are curved spikes just like Shedder’s shoulder armor. This backpack comes fully stocked with a padded laptop compartment, a small zippered compartment for any laptop cords, a main zippered compartment with 6 pouches and 1 tablet pocket, 2 exterior side pockets, and adjustable straps. This Teenage Mutant Ninja Turtles Shredder 3D Molded Armor Samurai Backpack measures about 17-inches tall.